A fully automated trading system uses a strategy based on the readings of embedded indicators, market volatility and analysis of candlestick patterns. The analysis is conducted on multiple timeframes. The default settings are suitable for trading on EUR / USD, GBP / USD, EUR / GBP, AUD / USD. On other currency pairs has not been verified. EA does not depend on the timeframe on which it works. 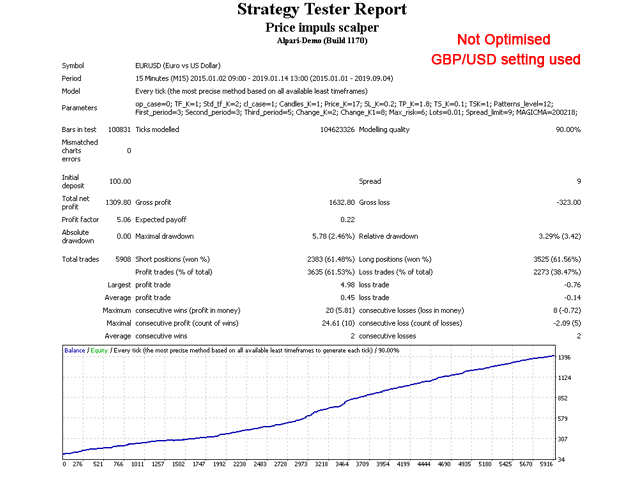 Trailing Stop, StopLoss and TakeProfit are set separately for each order, depending on the current market conditions. It is recommended to use the adviser on an ECN account with a small spread. By default, it is configured to work with a spread of no more than 10.
op_case - is a parameter for opening deals. It can take values ​​from 0 to 4. TF_K - is the timeframe selection parameter for calculating market conditions. It can take values ​​from 0 to 2. 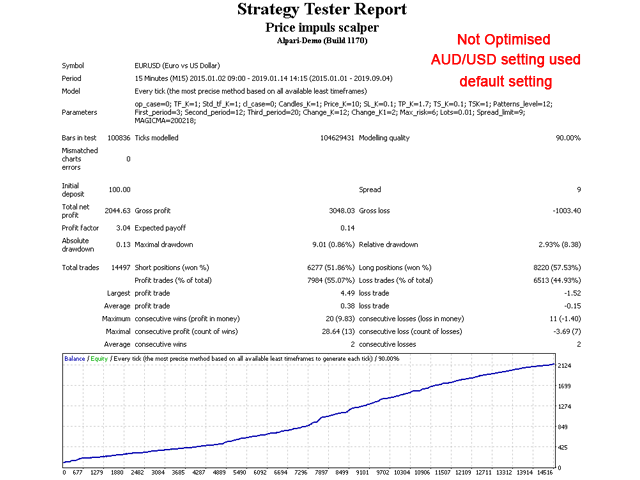 Std_tf_K - is the volatility calculation parameter. It can take values ​​from 1 to 2.
cl_case - is a condition for closing deals. It can take values ​​from 0 to 2. Candles_K - parameter analysis of candlestick patterns. It can take values ​​from 1 to 10. Price_K - parameter analysis of the current price. It can take values ​​from 1 to 20. SL_K - coefficient for calculating the StopLoss of the order to be opened. It can take values ​​from 0.1 to 2. TP_K - Trailing calculation coefficient of the order to open. It can take values ​​from 0.1 to 2. 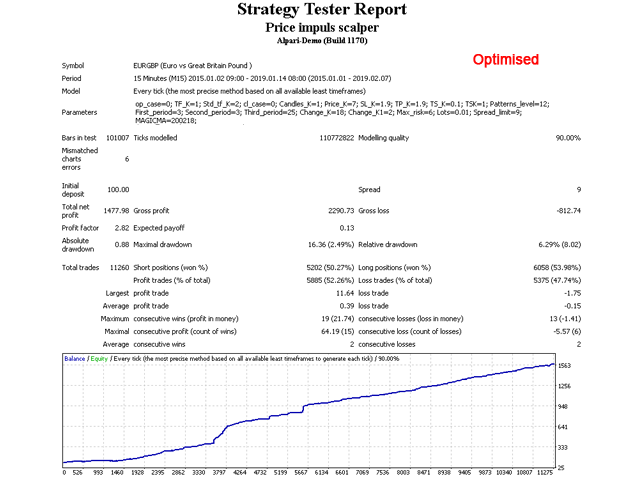 TS_K - coefficient for calculating the Trailing Stop of the current order. It can take values ​​from 0.1 to 2. TSK - is a parameter of the Trailing Stop processing option. It can take values ​​from 0 to 1. Patterns_level - is an internal coefficient that determines the recognition accuracy of candlestick patterns. It can take values ​​from 5 to 14. First_period, Second_period, Third_period - periods for which the price movement is calculated. Can take values ​​from 3 to 25. Change_K and Change_K1 - internal factors used to calculate the rate of change of price. Can take values ​​from 2 to 20. Max_risk - maximum risk of loss from one order in the deposit currency. Spread_limit - maximum spread for which trading is possible. MAGICMA - is a magic number.